KIMCHI BRAISED CHICKEN-- Yum. I made this in my instant pot using the slow cooker setting. I found that four hours was a bit too long--the chicken was totally falling off the bone, which I wouldn't have minded had I removed the skin, but next time I'd probably check at around the 3-hour mark. I did have to reduce the liquid a fair amount (which is easy in an instant pot since you can just turn on the sautee setting, but would be more difficult in a real slow cooker). The final squeeze of lime and dash of red pepper flakes is really essential to make this dish pop. We loved the resulting moist chicken and highly flavorful broth, and I would repeat. Great flavor to this oatmeal. I went for the longer cooking time and the texture of the oats held up no problem. The pear softened and was caramelized but also held its shape. Will definitely make this again! For the ingredients used, I was expecting this to be a lot more flavoursome than the resulting end product. Delicious but a lot of work. Got a nasty burn in my right wrist from splattering oil. I could only fit 1/8 of an onion, not a quarter. We really liked this dish, even though I blew out the faro because I didn't realize I had purchased 10 minute cooking faro. (Oops.) I liked the freshness that the tomatoes, olives, and feta brought to the table here. I was taste testing periodically and already thought the stew/soup (to me this was closer to thicker soup) was very good before adding feta, tomatoes and kalamata which were added towards the end. Although I liked the addition of tomatoes for burst of color and kalamata for briny sour taste, I was not sure if feta added much to the total flavor overall. For the added cost I would more likely skip on feta next time or just use enough sprinkled at the table individually. Instead of kalamata, I chopped dill pickles for my husband's portion and that served the similar purpose as kalamata. Added handful of dried mixed mushrooms from the beginning and tossed in komatsuna green along with tomatoes and feta. This was a big hit, kids loved the farro and it's going to go into regular rotation. Wow, this was great-including all of the component recipes. I used flat ribs instead of short ribs as that was what was available through my CSA, and they worked well in this application. (I only had time to cook them for 12 hours- they were tender but not fall off the bone.) The juniper, rosemary, and port flavors worked so well together. These were easy to make and will be my go to mashed sweet potato recipe from now on. Delicious. This was my first time trying sweet potato greens and I really liked them. They are fairly tender so don't need a long cook. (Kind of like spinach.) I thought the lime and ginger additions were good matches. 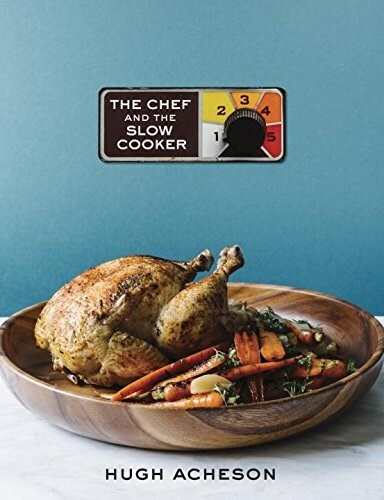 This cookbook is an homage to all of the unexpectedly fancy and impressive things you can expertly execute in a slow cooker. I’ve mostly shied away from slow cookers in the past, instead relying on my oven for soups, braises, and the like. However, I’m interested to see what an award-winning chef can do with it.